So a couple weeks ago a French website posted a recipe for carbonara and all of Italy lost their collective mind. France, why do you want to piss this guy off? The procedure called for the whole thing to be boiled altogether in one pot. And while I’m a fan of the odd one-pot pasta, carbonara should not be trifled with in such a manner. The classic recipe is extremely simple with just four ingredients: spaghetti, pancetta, eggs, and Parmesan cheese. 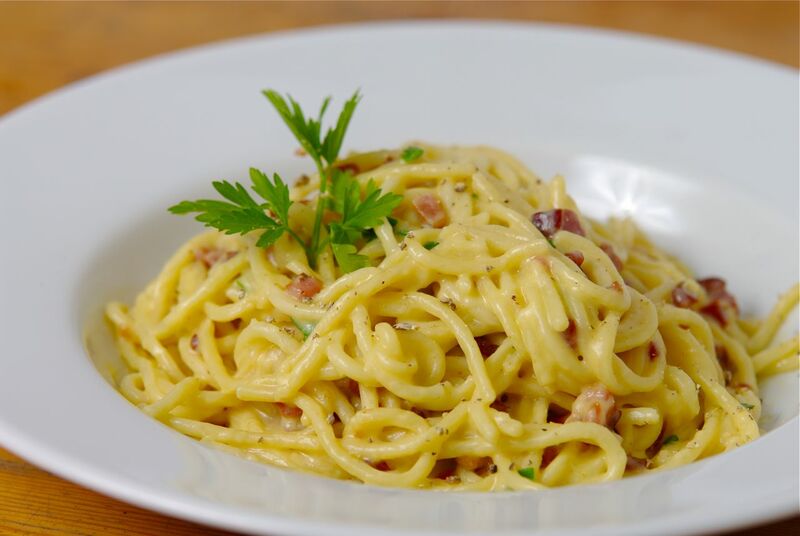 But simple, especially in the case of carbonara, absolutely does not mean easy. It’s far easier to botch it and end up with a greasy congealed tangle of noodles that look more like a punishment than dinner. As appetizing as a letter from the IRS. What can go wrong: Over, or undercook the spaghetti. You can burn, or conversely fail to render the pancetta and have limp, fatty pork. And the most problematic of all are the eggs. If the heat is too high, or you don’t stir briskly enough, you get scrambled eggs. And if you do stir with enough vigor it’s possible to not have the now broken pasta hot enough to cook the eggs. It is a dance that’s potentially dangerous enough to strike fear in the heart of the very finest dancing “celebrity”. But done right? Done right it’s a song sung by Freddy Mercury or Billie Holiday. It’s a landscape by Ansel Adams, a shoe by Louboutin, a dress by Coco Chanel all rolled up into one creamy, unctuous, heart-breakingly delicious bowl of pasta. See how that sauce clings like a bad boyfriend? That’s what I’m talking about. My advice from the trenches is to have every bit of your prep done before you turn on burner one. If you’re not ready every step of the way, the whole thing will get away from you, and that way lies madness and scrambled disappointment. Take your time—be the master of your culinary domain, and don’t let the food dictate your actions and state of mind. You have to commit; you’re cooking something that’s a little advanced; don’t be tentative. Attitude is half the battle. My recipe has a healthy serving of attitude. I had some beautiful fresh angel hair pasta and decided that it really needed to be used for carbonara. But I had bacon, and not pancetta. I was also very low on Parmesan, but had a nice big piece of aged Manchego, which is very hard and dry like Parm. So I made an executive decision. But purists might take issue with it. Place eggs and cheese into bowl, season, and whisk until well-mixed. In a large pot, cook pasta until al dente in heavily salted water. In a separate large pan, render bacon. Remove and set aside. Pour off bacon fat until 2 tablespoons are left. Turn pan down to low. Remove cooked pasta from pot with tongs, reserving water. Place directly into pot with bacon fat. Toss until well-coated. Take pot off heat and slowly pour in egg mixture while constantly, vigorously, stirring pasta. When it’s all added, continue stirring until egg mixture is heated and emulsified. Briefly place pot back over a low burner if more heat is needed to thicken (sauce should be the consistency of heavy cream). If it just looks like raw beaten eggs, it needs more gentle heat. If it seems a little tight, add in abit of pasta water. Place into two bowls and garnish with the bacon and more cheese. If the idea of this pasta dish appeals to you, I really hope you try making it. And it’s entirely possible that you’ll screw it up the first time. It’s probably wise to have a dinner backup plan that night, just in case. But I’m telling you, getting this right has a huge payoff. Not only do you get to enjoy what is arguably one of Italy’s finest gifts to mankind (even taking into account Ancient Rome and the Renaissance), you’ll have the thrill of being the kitchen swashbuckler who had the chops to put this ambrosia on the table. You are fierce.